The 11th annual Vincentric Best Fleet Value in America awards were announced today, with strong performances by both the Nissan and Ford product line-up. Award winning vehicles were determined to have the lowest total cost of ownership in their vehicle segments based on an analysis of 8 cost factors covering 20 different lifecycle cost scenarios, allowing fleet buyers to make informed decisions on the best value vehicles for their organization. "Our 2016 awards identified best-in-class lifecycle costs among a large number of automotive manufacturers, many of whom have not been considered traditional fleet brands," stated David Wurster, President of Vincentric. The 11th Annual Vincentric Best Fleet Value in America™ awards were announced today, with Nissan North America leading the way with ten winning vehicles. Ford Motor Company, led by the strength of its Transit van line-up, also performed well, earning seven Vincentric awards. General Motors showed its fleet value by sweeping all three full-size pickup segments while Toyota also did well with four Vincentric Best Fleet Value in America awards. The broad strength of the Nissan product line was evident as the company delivered winning vehicles in each of the four Vincentric award categories: Passenger Cars, SUV/Crossovers, Trucks, and Vans. In addition to its strength in commercial vans, Ford showed that its Lincoln line-up is ready to compete in the luxury market with two winning vehicles. Other brands with multiple winners were BMW, Hyundai, Mercedes-Benz, Subaru, and Volvo. "Our 2016 awards identified best-in-class lifecycle costs among a large number of automotive manufacturers, many of whom have not been considered traditional fleet brands," stated David Wurster, President of Vincentric. "This shows the increasing competitiveness in today's fleet market and highlights the importance of performing a lifecycle cost analysis to help identify the best vehicles to include in an organization's fleet." 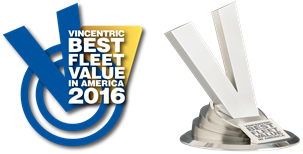 To determine the 2016 Vincentric Best Fleet Value in America™ awards Vincentric performed a cost of ownership analysis on over 2,400 vehicle configurations based upon typical fleet use. Vincentric measures cost of ownership using eight different cost factors: depreciation, fees & taxes, financing, fuel, insurance, maintenance, opportunity cost, and repairs. Each vehicle was evaluated in all 50 states plus DC using 20 difference lifecycle cost scenarios. Winners were identified by determining which vehicles had the lowest fleet lifecycle cost in the most scenarios for its segment. Further information regarding the Vincentric Best Fleet Value in America awards and other industry reports from Vincentric are available at http://www.vincentric.com, or by contacting Michelle Otremba at (248) 430-4121 or michelle(dot)otremba(at)vincentric(dot)com. Vincentric provides data, knowledge, and insight to the automotive industry by identifying and applying the many aspects of automotive value. Vincentric data is used by organizations such as Business Fleet Magazine, Ford Motor Company, Cars.com, General Motors, Toyota, BMW, Mercedes-Benz, Nissan, NADA Guides, Hyundai, Union Leasing and Fleet-Central.com as a means of providing automotive insight to their clientele. Vincentric, LLC is a privately held automotive data compilation and analysis firm headquartered in Bingham Farms, Michigan.